Power and signal circular connectors designed to be used on servo motors and in servo harnessing. The LS1 power circular connectors with the contact configurations 5+PE, 3+PE+4 are designed to be used in servo motors and servo harnessing. Available in coupler, connector and panel mount configurations that satisfy simple cable-to-cable and cable-to-machine requirements. The circular connectors come with an integrated EMC screen termination. 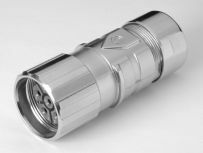 Click here to see our full range of LS1 circular connectors. The M23 SIGNAL circular connectors are designed for signal transmission in servo motors and servo harnessing, measurement and control technology, and plant engineering. Available in coupler, connector and panel mount configurations that satisfy simple cable-to-cable and cable-to-machine requirements. Contacts available in crimp or solder terminations. Three keying arrangements to avoid incorrect mating. See our full range of M23 circular connectors.